At IPMC Independent Physicians Medical Center we work hard to meet and exceed the expectations of all the doctors who entrust their patients to us. We achieve this through these three components: care, comfort and convenience. The optimum medical care is of utmost importance to us, so we combine the best technology has to offer with the knowledge and experience of our doctors, technologists, and staff. But any doctor knows, no matter how smart, dedicated, and experienced you are, to a patient you are only as good as your bedside manner. This is why we make sure that all of our technologists are not only good at what they do, but are also caring and compassionate. They listen to the patients and, in some cases, will even contact the referring physician if they think that they can do more. Our staff undergoes a rigorous training process so that they are able to answer all the patients’ questions and they always do it with a smile. We strive to make the IPMC experience convenient for patients and their referring physicians. This is why our radiologists are always available to discuss patient reports with the referring physician, even when they are not in the office. We know that working with insurance companies can be difficult and time-consuming, that is why our billing department is there to help with getting the right codes, aid in getting preauthorizations and answer any questions. We check insurances prior to any procedure so that the patient is aware of any necessary co-pays, referrals or preauthorizations, and we keep the lines of communication open between our office, the patient and the referring physician, so that everything gets done in a timely manner. Our turnaround time for reports is a maximum of 2 business days and, should they request it, the patients can have their CD or films at the end of the appointment. We do not require a lengthy process of requesting images or reports on an official form that takes 3-6 weeks to process. All a patient has to do is call and request their films and they will be ready for pick-up the next business day. 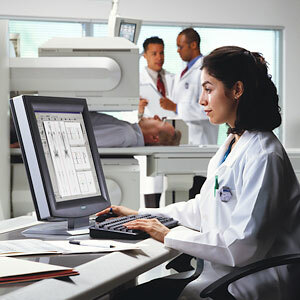 As for the referring physicians, they can access everything digitally, from any computer, through our RIS option.